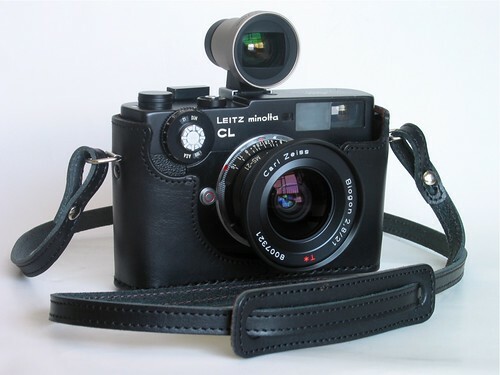 Carl Zeiss G Biogon 21/2.8 converted to Leica M mount by MS Optical on a Leitz Minolta CL, handmade Hirano leather camera case. 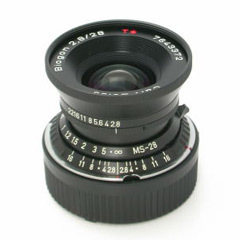 As an alternative to sending us your G lens for conversion, we are pleased to offer rangefinder-coupled Carl Zeiss Contax G lenses pre-converted by MS Optical ready for you to use on your Leica M mount camera. We hand-select the source lenses and then have them converted for you ready to use with minimal wait or cost. Prices include the lens itself and worldwide express shipping! 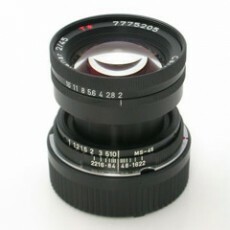 Please note that the above prices are for lenses which have been converted (i.e. lens included). For conversion only of your own lenses, please contact us. Please use the links to order (Paypal account is not required to make payment). Orders of multiple items is possible. Payments are in Japanese yen (rates for guidance only, currency conversion rates of your financial institution apply). Converted stock is shipped immediately, non-converted stock within one week, non-stock of either within approx. 10 days. Note about usage of converted lenses on Epson RD-1: due to properties of the Epson RD-1 camera body/mount, converted lenses need to be adjusted individually with the camera present. Unless you wish to send your RD-1 to us we recommend against using converted lenses on the RD-1 as it may cause focussing errors. 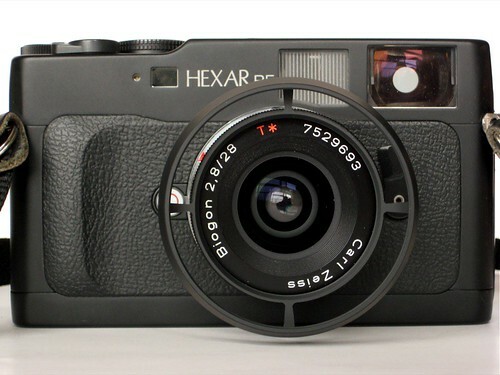 This issue does not affect other cameras, including the Leica M8, which operates flawlessly with the converted G lenses. Optically, I prefer the Zeiss-for-Contax G 21mm f/2.8. It’s slightly sharper wide open and has far less distortion than this Leica 21mm f/2.8. I can see distortion with this Leica lens, but I can’t see any with the Zeiss-for-Contax G. According to the manufacturers’ data, the Zeiss-for-Contax G has only one-third the distortion of this Leica lens. 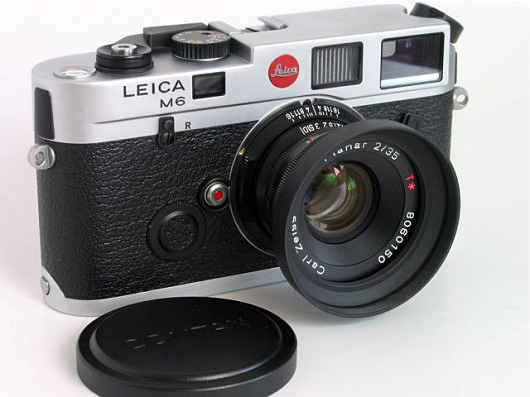 That’s because the Zeiss lens appears not to be a retrofocus design, while this Leica lens is. 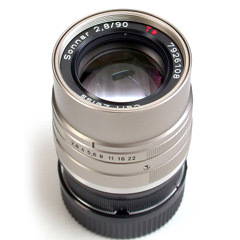 Contax Carl Zeiss G Sonnar T* 90mm f/2.8 (Black) on Leica M8. Photo courtesy of S Lee. Do the converted lenses have the same properties, e.g. close focus, as the originals? The lenses will retain most of their specs (see also below). Obvious physical differences are weight and physical dimensions. 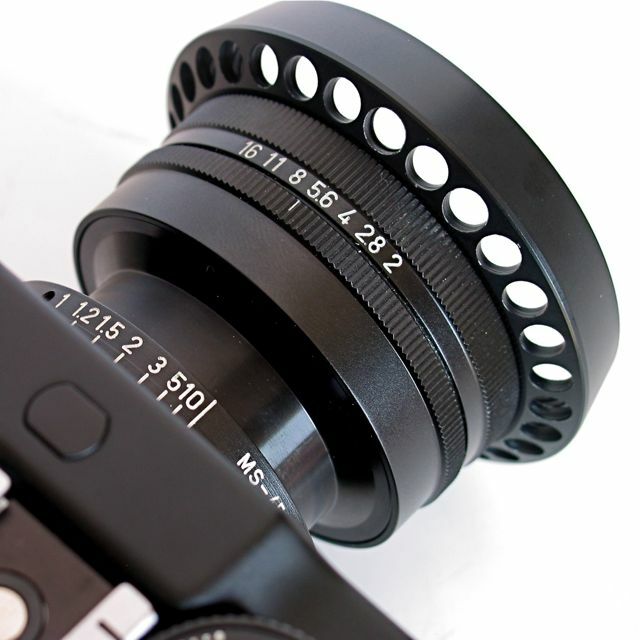 The front of the lens is almost unchanged so filters and accessories will not be affected. As for close focus, it will be similar to the original specification and the detailed test certificate accompanying each lens will state it, along with other individual details pertaining to that lens. The aperture ring mechanics are replaced so there won’t be click stops for the aperture settings, similar to view camera lenses. The helicoid will have a depth of field scale that the original G lenses do not have (except the 90/2.8 which retains its original shell). Is is possible to convert the Contax G 35-70 zoom lens to Leica mount? Unfortunately the 35-70 zoom can not be converted. Are the converted lenses rangefinder-coupled? Yes, with the exception of the Hologon 16, which is not coupled on the G system either. Will the converted lenses have 6-bit encoding? Yes — the M mount ring will have a recessed area to apply the bit coding marks and you can code the lens non-permanently by means of a marker pen. Can the lenses be encased in barrels with colours other than black? At this point we can only offer a black finish, no matter if your source lenses are champagne or black G lenses (except the 90/2.8 which retains its original shell). 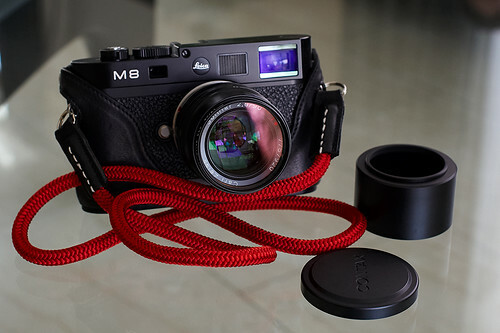 Can I have my lens converted to Leica L rather than M? 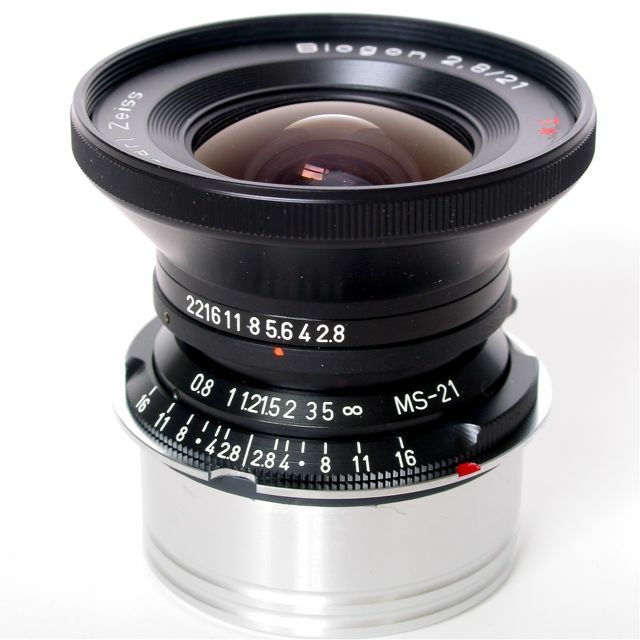 At the core the lenses will be converted to LTM mount lenses. However their use as L lenses directly on camera requires some additional technical calibration with the camera so we decided that for customers outside of Japan we would only offer M mount conversions. The M mount will be semi-permanently fixed and can be removed if you really wanted to, but doing so may create focussing issues so it is not recommended. 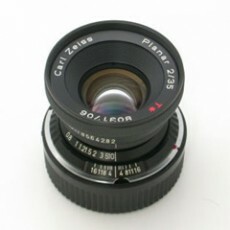 I have a set of of G lenses that I am thinking of converting. Do you offer any quantity discounts? Unfortunately there is no quantity discount available. 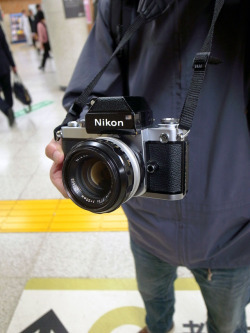 The conversion is a service rather than a physical product, which makes quantity discounts for difficult to justify as the time it takes to convert a lens does not change even with many lenses. In the case of multiple lenses we will try adding another bonus like free return shipping or lens hoods/filters for your lenses. Data sheets including MTF charts for Contax G lenses can be found at Carl Zeiss AG. 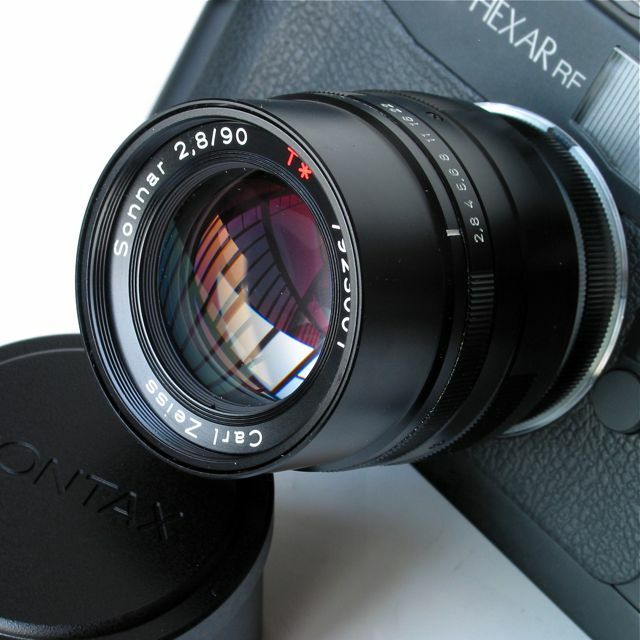 If you would like to discuss or order lens conversion, please contact us with your request using the form below and we will provide further details.